Defending taxpayers and tax preparers against claims by the IRS and DOJ in matters involving income tax, payroll tax, preparer penalties and other tax issues. 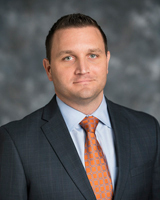 Sought by his clients for his thoughtful and effective demeanor, Clint takes a collaborative approach to disputes, working with opposing counsel to resolve matters quickly and efficiently. In those cases where collaboration is not an option, his clients (and opponents alike) find him to be an earnest, aggressive and effective advocate for his clients’ interests. He has obtained dozens of summary judgments for his clients in both federal and state courts and has been lead trial counsel in cases ranging from tax disputes to professional malpractice lawsuits. Clint also counsels both business and professional clients regarding risk management, and he regularly speaks before lawyers and accountants regarding ethical issues and other topics. Successfully represented a CPA and tax preparer in an action brought in federal court by the Department of Justice arising out of an extremely complex tax avoidance plan, which led to initially obtaining a partial summary judgment disposing of the government’s fraud claims, then prevailing at trial on all remaining claims. Obtained a state court jury verdict for a law firm in a suit to recover unpaid fees while obtaining summary judgment on all of the defendant’s legal malpractice counterclaims. Obtained a judgment in federal court for plaintiff business owner asserting claims arising out of a corporate merger. Obtained complete summary judgment on claims against law firm arising out of an underlying patent dispute. Obtained complete dismissal of claims against an insurance broker arising out of the procurement of life insurance policies. Admitted to practice before the U.S. Court of Appeals for the Fifth Circuit, the United States Tax Court, and the United States District Courts for the Northern, Southern, Western and Eastern Districts of Texas.